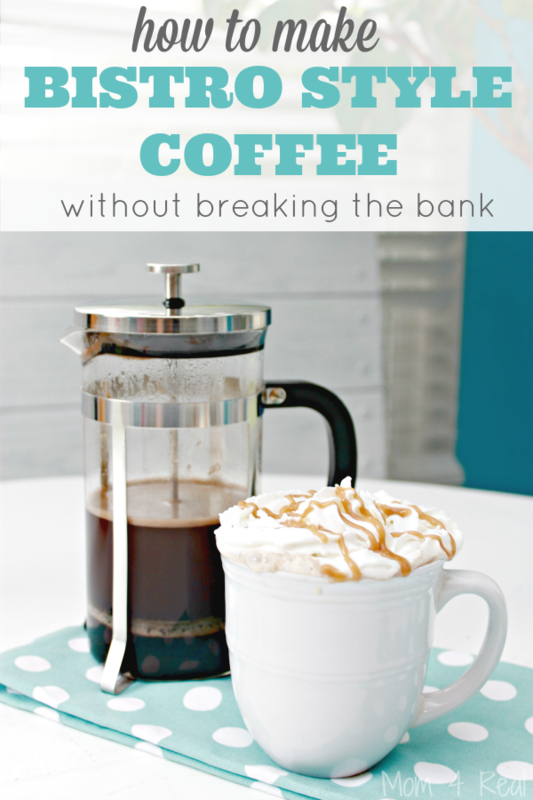 Have you ever had a cup of coffee that trumped all other cups of coffee you’ve ever drank, and pretty much ruined all other coffee for you going forward? Well, this is exactly what happened to my friend Jen and I on a fabulous trip to the Cayman Islands. The coffee was soooo amazing, and when we got home, we whined about it a lot…even on Facebook for everyone to see. We had become coffee snobs. I told my husband and Jen that I was going to ditch my expensive coffee maker and buy a French press. I’m pretty sure they thought I was insane. Heck, even I thought I may be losing it. 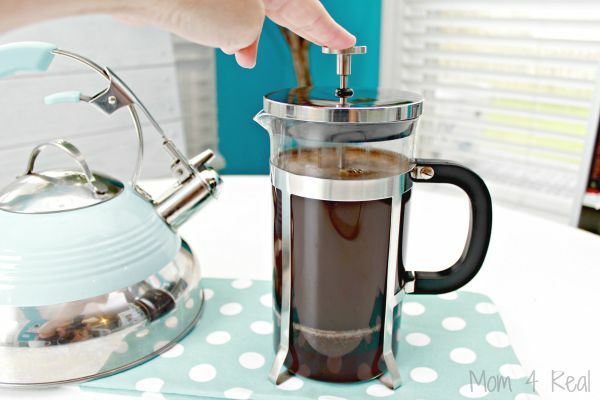 It took me about a week to talk myself into making the jump from coffee machine to French press…I was afraid it would be a little too much work pre-coffee, first thing in the morning. I was wrong. So wrong. 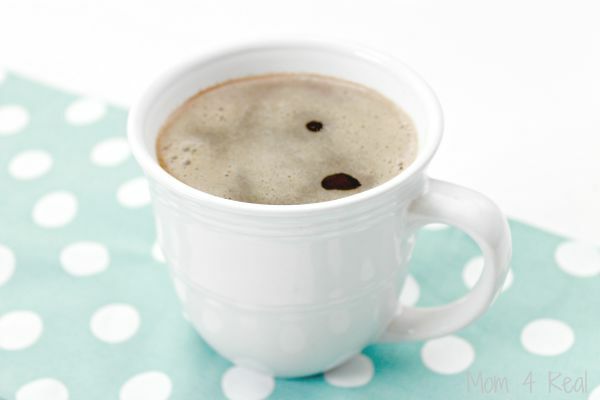 Friends, I am telling you, it’s so easy to make your own bistro style coffee and IT IS TOTALLY WORTH IT! I add around 4 tbsp. 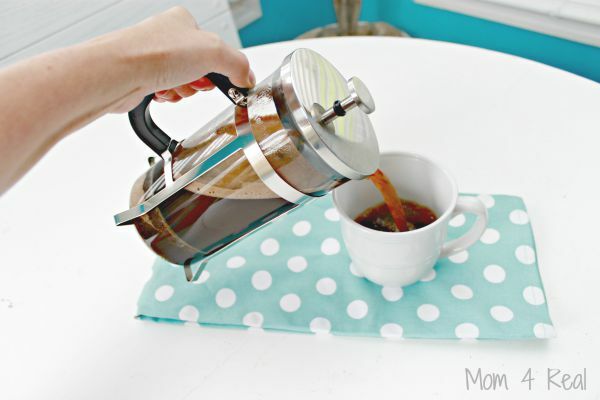 of ground coffee to my French press. 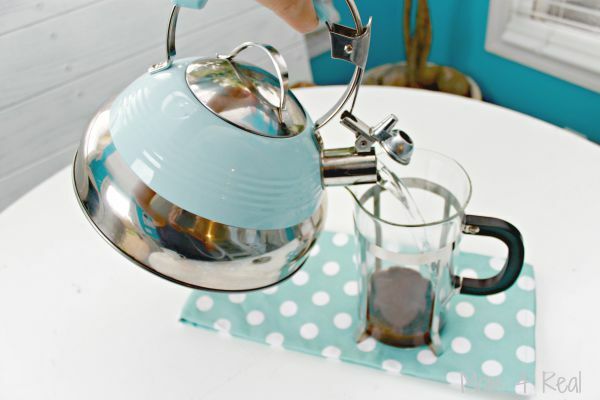 I boil water in a tea kettle on our stove, and once it starts to whistle, I pour the hot water into the French press all the way up to the top band. BE CAREFUL not to pour the boiling water on yourself! Get the kiddos out of the way. 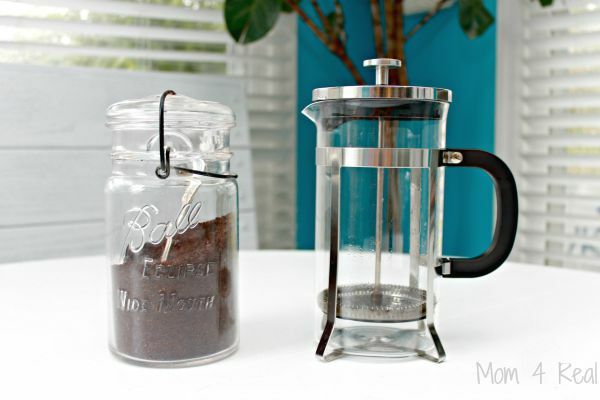 Place the press and lid on the glass container and slowly press the valve down until it stops. This pushes the coffee grinds to the bottom. Let your coffee sit for a few minutes….the longer it sits, the stronger it will get. 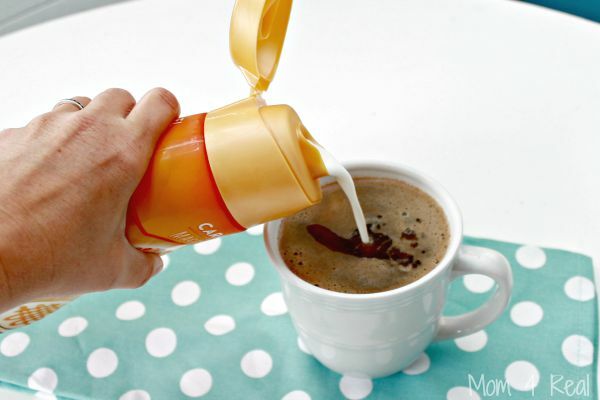 Now, add your favorite creamer to make it bistro style. I love my International Delight Caramel Macchiato! Now take it up a notch with a little whipped cream and caramel drizzled over the top. Oh my word…pure heaven! 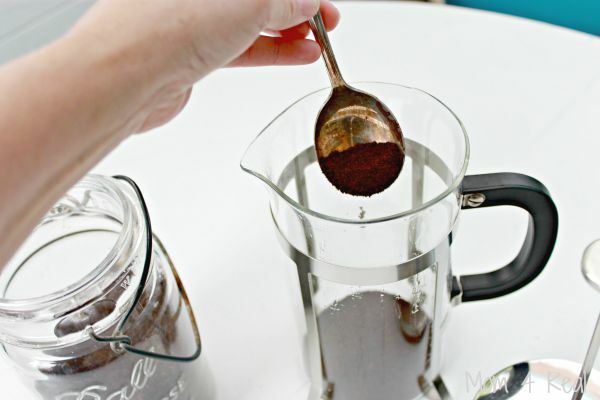 Friends, it seriously doesn’t take much time at all to make coffee this way. I fill my tea kettle the night before and when I wake up I turn on the burner. While the water is coming to a boil, I add the coffee to the french press. It takes minutes after that, and it’s soooo ridiculously worth it. Adding the Caramel Macchiato Creamer takes it to a new level…I actually look forward to going to bed sometimes so I can wake up and have my coffee! 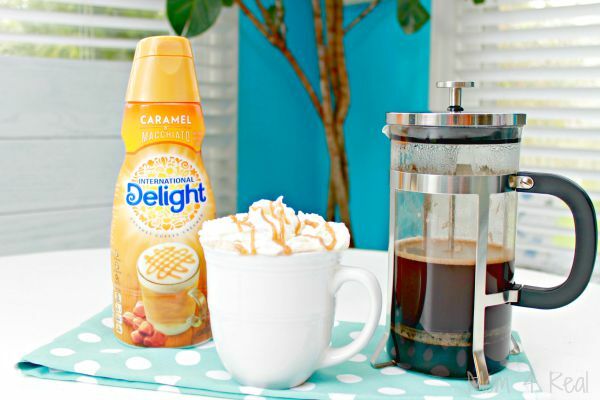 Check out all of International Delight’s amazing creamers and Create Your Own Delight! Be sure to sign up for International Delight’s Newsletter, and follow them on Pinterest, Instagram, Facebook and Twitter too! During the winter months, it cools fast. So find a warm place to brew. Where did you get your tea pot? I love it! Se debe dejar reposar el café con el agua unos 2 minutos antes de presionar la prensa.